Vitrue's Social Page Evaluator was designed to help marketers better understand a Facebook page's value. (Mashable) -- Social media management company Vitrue released a free tool Thursday, the Social Page Evaluator, designed to help marketers get a better understanding of a Facebook page's value. It's a cool -- if not completely scientific -- way to gauge the potential value of your Facebook page to advertisers. The formula used by the Social Page Evaluator is related to the formula that Vitrue released last month to estimate the relative value of Facebook Fans to big brands. The tool, which was built over 63 hours in a Startup Weekend-style project, is adjustable and interactive. For instance, the base rate of Earned Media Value (or CPM in more traditional terms) is $5, but this can be adjusted to a higher or lower value depending on the brand in question. Likewise, there is a "Fan-tasize" section that lets you manipulate other features like number of posts per day, engagement level and Fan count to see how that affects the valuation. 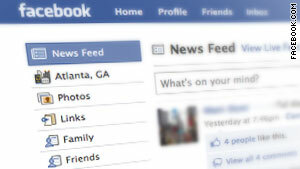 You can also compare a Facebook Page with up to three other brands at a time and view a Page's value history. In addition to the valuation data, there is also a list of best practices for getting the most out of your Facebook Page. So how accurate is this tool? It's difficult to determine, as it is based on a formula that, while derived from a study of large brands, is obviously not going to be applicable to all companies. Still, it's a fun, easy way to get an idea of the factors that impact a Facebook Page valuation. It's also a good stepping stone for marketers to start thinking about the potential advertising power of a Facebook Page. What do you think of the tool? Let us know!